This blog chronicles the building of my healthy house–materials used, mistakes made, advice I would give myself if I could travel back in time to the beginning of the project. Where Do You Live While Building Your Healthy House? The lime plaster is colored with natural yellow ochre pigment. The kitchen cabinets are aluminum frames with tempered glass panels and tempered glass shelves. The main room with the kitchen, dining room and livingroom. The ceiling follows the roofline. Tongue and groove aspen ceiling was sealed with 3 coats of AFM Safeseal. Natural plaster walls are earth, sand, and water mixed on site. Solid wood (poplar) interior doors were sealed with AFM Safeseal. The portale is made of poplar wood, the tile was set with cement mortar and grouted with cement. Tadelakt is a moroccan technique where lime plaster is smoothed with polished stones and sealed with soap–in this case unscented olive oil soap. 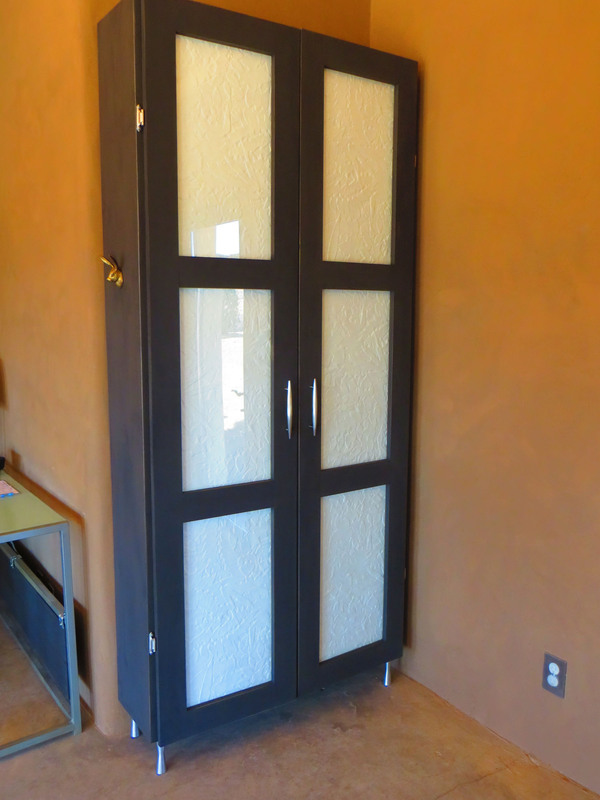 Bedroom closets are solid wood with milk paint finish and glass in doors. Foyer cabinets are aluminum frames with tempered glass panels and shelves. Solid wood storage cabinet is painted with milk paint. Computer in a glass fronted box that vents through a duct in the wall. Nominated for a reader's choice award, The Test is an illustrated novella about waiting for SCARY LABS!